Once a year, I trek across the pond to Treasure Island (or as most people call it, England). 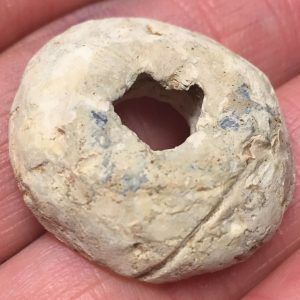 It’s a long journey comprised of a red-eye flight, a long bus or cab ride, and then miles of walking up and down ancient fields hoping to find medieval, Roman or Saxon artifacts. So far in my detecting career, I’ve found two of the three on the aforementioned list. Will I find something Saxon this year to complete my wish list? Time will tell. 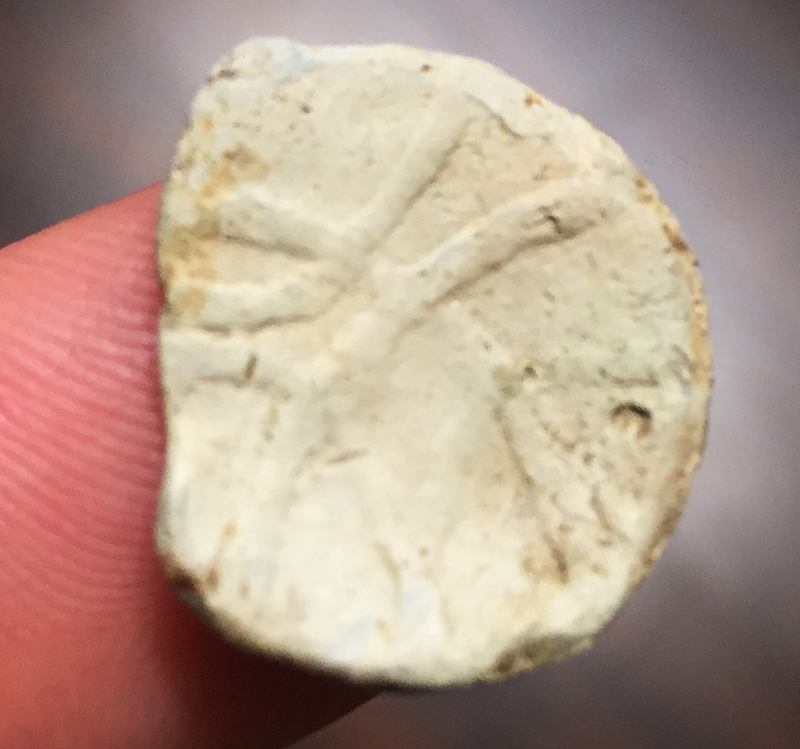 Grant detecting among hundreds of acres of ancient land. Traveling with the XP Deus is easy. Because it’s so compact and light I have room to cram in other, heavy necessities like a variety of clothing, digging tools and camera equipment. I can easily pack both my stock 11-inch coil and my HF 9-inch coil, without having to worry about weight or space. Because the HF coil offers a different range of frequencies than the stock coil, it’s like I’m able to pack two metal detectors – without having to pack two metal detectors. In 2016, two friends and I traveled to William Shakespeare’s birthplace, Stratford-upon-Avon. Southern Seekers had organized a weekend rally along Fosse Way – an historic Roman road that runs north and south across England. Rather than camp out at the rally, we stayed at a nearby bed and breakfast, originally built in the 16th century. On the B&B’s property was the foundation of a Norman-era castle! What was even more unbelievable was that the owners gave us permission to detect the property the day before the rally. While the area surrounding the castle foundation was off limits, we still had plenty of lawn to keep us busy. 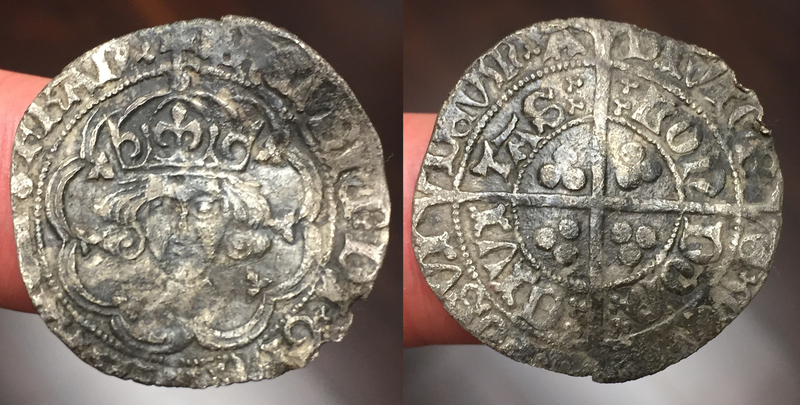 I didn’t find anything of note, but my friend James found a lovely 16th-century dolphin-motif French jetton. So, as you can imagine, we were really excited for the weekend. It can be rather daunting when you have hundreds of acres to detect over a short timeframe. Where do you start? Where’s the best spot? Finding your way can be a little frantic until the other detectorists slowly disperses out of sight, and the fields have plenty of swinging room. On the first field I detected I was quick to find some buttons and lead, but nothing extraordinary. The dirt was hard-packed clay – once you got down a few inches it was thick and heavy, making deep targets challenging to retrieve. After putting in a few good efforts and coming up with just small lead fragments, I couldn’t help but feel frustrated. I swung my coil for a while without a solid signal, and then my Deus gave me a high-pitched, deep, repeatable target. I wasn’t sure if it would be something good or just more garbage, and there was only one way to find out. I began to dig, and dig, and dig. The clay was getting more and more difficult the deeper I got, and I was close to giving up. I told myself, “One more spade’s worth and if it’s not there, then I’m filling the hole back in.” After I dug out some more clay, my pin pointer sounded off in the side wall, but then went silent as I went deeper. This was great! I knew I didn’t have to keep digging deeper, and that the target was close in hand. I carefully dug into the side wall and removed a chunk of clay. Finally! I got it out of the ground. I couldn’t believe my eyes when it revealed itself. Could it be? A hammered coin! 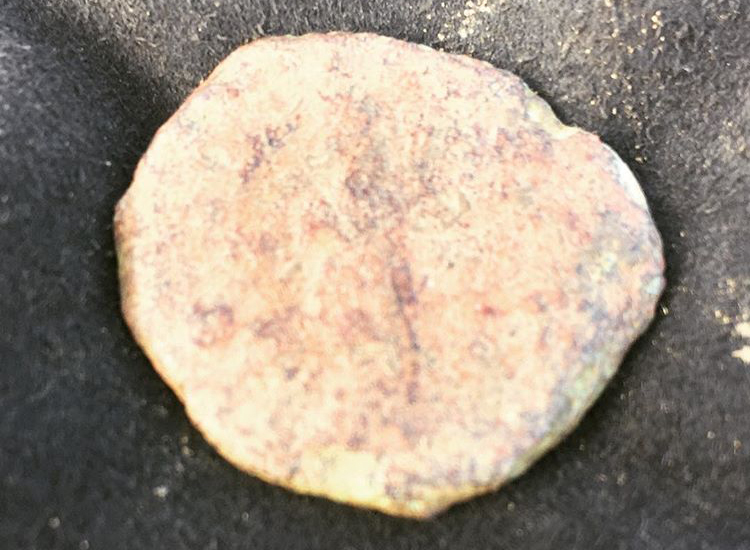 And it was bigger than the hammered pennies I usually see. It was a 15th-century King Henry VII silver hammered groat! I was thrilled! 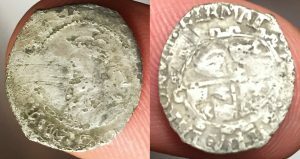 I had just found a large, hammered, 500-plus year old silver coin! 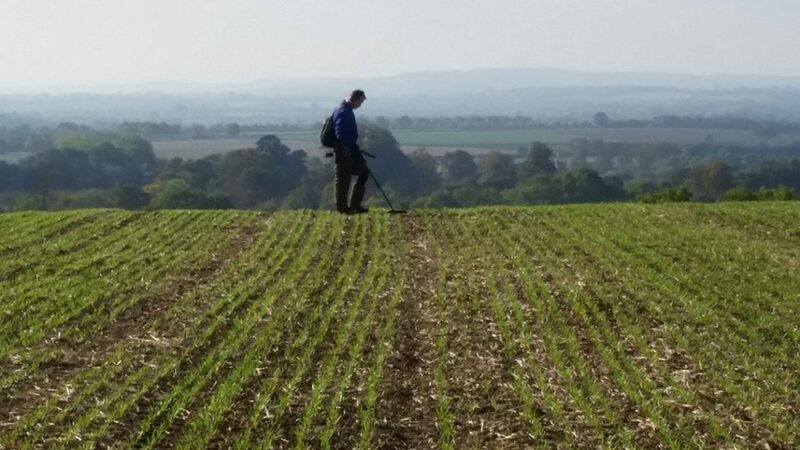 I honestly believe that many detectors would have missed the signal, or at least, many detectorists would have ignored it because it was so deep. 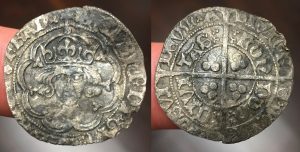 King Henry VII silver hammered groat from the 15th century. The fields continued to produce. I found three Roman coins, which I’m told are from the second- to third-century AD. Two small ones are very corroded; the large one (pictured below) gave a screaming high tone, even though it was very deep. I was half expecting a large piece of metallic garbage since it sounded too good to be true – but it wasn’t! 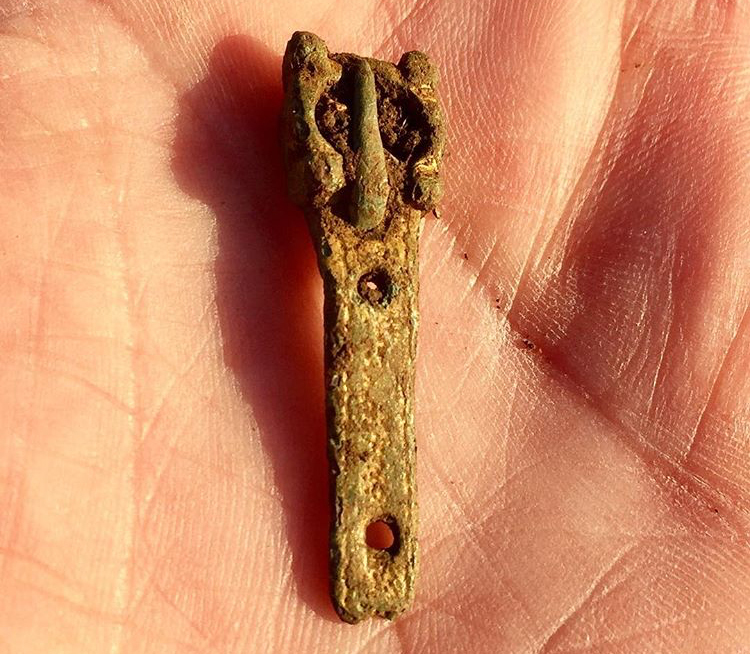 I also found a beautiful medieval strap end that still has some its golden gilt. I’m told this strap end was most likely used as a book fastener, and would have been owned by someone of wealth and education. Imagine, over 500 years ago someone lost this – perhaps even the entire book which has since deteriorated completely. In 2017 I found myself in a different area of England with the Medway History Finders in Kent. I met up with a couple old friends, and made some very good new ones – which is the real treasure of our hobby. I love sharing stories of my US finds, and hearing their amazing tales of treasure hunting in England. The Medway rally produced some great finds for me. I found two 17th-century King Charles I silver hammered pennies, two medieval lead tokens, a very heavy grape shot, and a medieval spindle whorl (among many other cool finds). And I even witnessed two friends each find their own Bronze Age hoards! 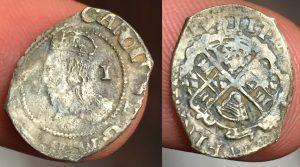 King Charles I silver hammered penny. 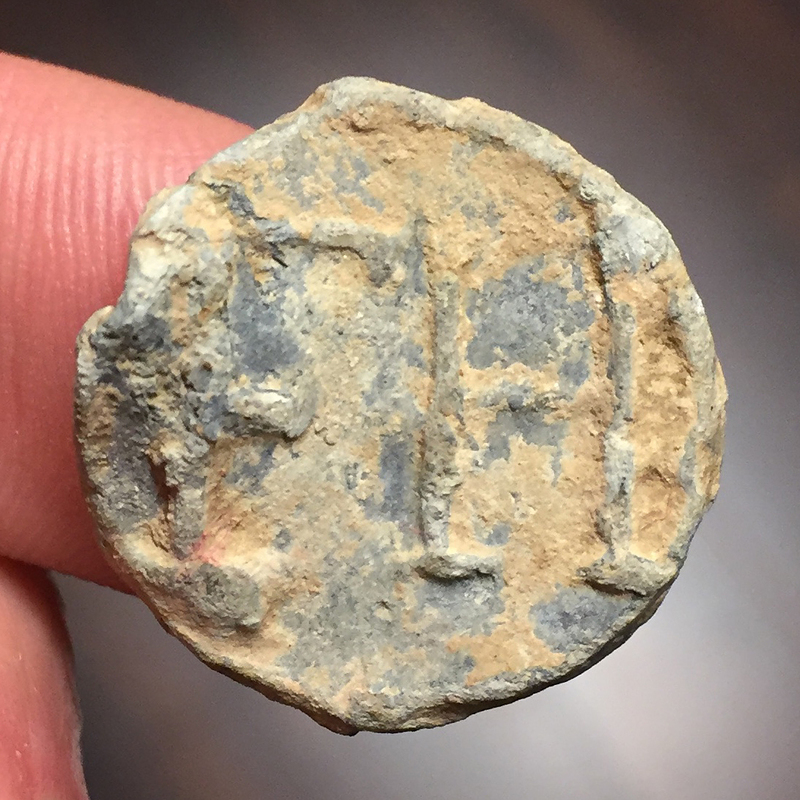 Medieval lead token with “FH” initials. 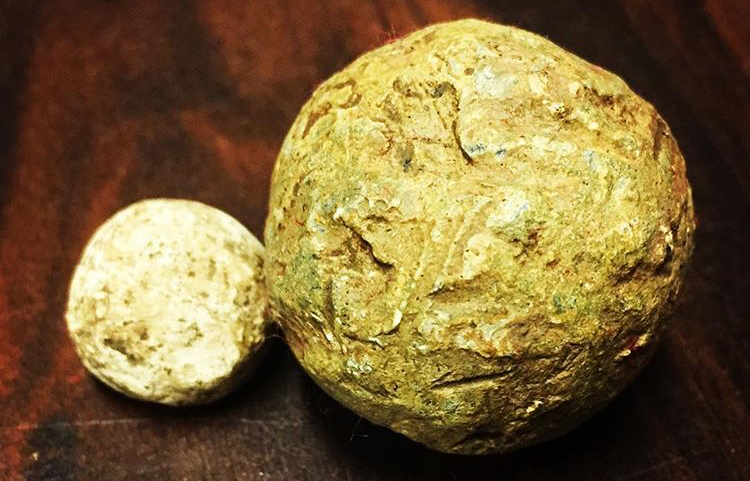 Huge grapeshot, pictured next to a musket ball for scale. September 2018 will have me traveling to the UK History Hunters weekender in South Devon. It’s an area steeped in history, and I can’t wait to swing my coil over the ancient dirt. I’m looking forward to some good luck, meeting up with old friends, and meeting new ones. Watch for me to broadcast some live digs and updates from the field!